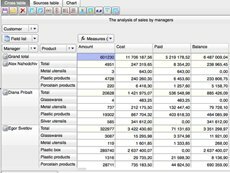 FastCube enables you to analyze data and to build summary tables (data slices) as well as create a variety of reports and graphs both easily and instantly. It's a handy tool for the efficient analysis of data arrays. FastCube FMX is a set of OLAP Desktop components. It supports Embarcadero Delphi XE4, XE5, XE6, C++Builder XE4 - XE6, RAD Studio XE4 and higher. You can integrate it to applications for MS Windows and Apple Mac OS X.